Return to Freedom and its coalition partners, The American Wild Horse Preservation Campaign, The Cloud Foundation, and wild horse photographers Carol Walker and Kimerlee Curyl, were granted the right to intervene in the case and filed a motion to dismiss the lawsuit against the BLM. 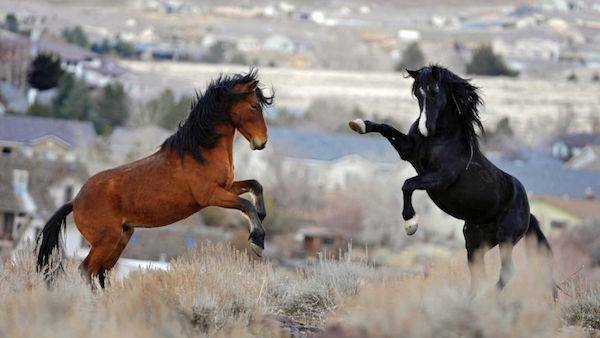 DENVER (Oct. 11, 2016) — Today, the U.S. Court of Appeals 10th Circuit upheld a lower court’s dismissal of a lawsuit filed by the State of Wyoming against the Bureau of Land Management seeking the removal of hundreds of wild horses from public lands across the state. At issue in the case, first filed in 2014, were wild horses in the Antelope Hills, Crooks Mountain, Green Mountain, Lost Creek, Stewart Creek, Fifteenmile and Little Colorado Herd Management Areas (HMAs) in Wyoming. “This is a major precedential victory that will have important implications for federal wild horse policy for decades to come,” said Bill Eubanks of the public interest law firm Meyer, Glitzenstein and Eubanks, which represented the intervenors in this case. Eubanks said that this precedential decision will impact similar pending cases at the Ninth Circuit Court of Appeals and in U.S. District Court in Utah, and should serve as a deterrent to other states, including Nevada, considering litigation to compel the federal government to round up and remove thousands of wild horses from Western public lands. The State of Wyoming lawsuit sought the removal of hundreds of wild horses from public lands in Wyoming, a state in where just 6,500 wild horses remain on 3.2 million acres of BLM-managed land. By contrast, hundreds of thousands of domestic cattle and sheep graze 18 million acres of BLM land in the state. Put another way, wild horses are present in Wyoming on just 2 percent of the BLM land grazed by livestock. Eubanks is also representing the groups on separate litigation involving the BLM’s decision to wipe out wild horses from the Wyoming Checkerboard, a two million acre area of public and private land in the southern part of the state. The groups are awaiting a Tenth Circuit decision on a 2014 lawsuit and have filed new litigation challenging the BLM’s plan to conduct another Wyoming Checkerboard roundup, beginning as early as Oct. 18. Return to Freedom (RTF) is a national non-profit dedicated to preserving the freedom, diversity and habitat of wild horses and burros through sanctuary, education, advocacy and conservation, and has operated the American Wild Horse Sanctuary in Central Coastal, CA. since 1998. Carol Walker and Kimerlee Curyl are renowned wild horse photographers who regularly photograph the wild horses of the Adobe Town, Great Divide Basin and Salt Wells Creek HMAs. Walker is also a board member for the Wild Horse Freedom Federation. Meyer Glitzenstein & Eubanks LLP is a public interest environmental law firm with offices in Washington, D.C. and Fort Collins, Colorado.